Burial insurance (or final expense insurance) sells well in the insurance market and it can make a great improvement to your sales volume. Agents who really want to climb up the sales ladder should learn about the best methods to sell these plans. NAAIP, the National Association of Accredited Insurance Professionals is well versed on how to sell final expense insurance by phone. This is thanks to a constant interaction with the best people in the industry which is backed by the considerable experience that they have in selling insurance plans. 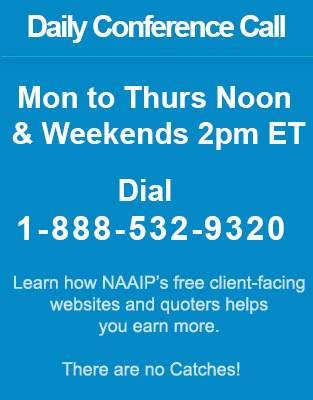 With NAAIP’s assistance, agents will see the difference straight away and will learn more about how to approach prospective clients and improve sales. What is the Best Approach with Burial Insurance? There is contrasting differences between what people are led to believe about selling final expense plans and the reality of it. Making call after call and getting nowhere is a common occurrence with insurance agents and there is lot of planning required in making every call count. You may think you are putting in the hard work and results will come, but are you being efficient in your methods? If you use the correct approach, you can improve results and halve your efforts. We have all worked 10 hours a day and returned home empty handed. This needn’t be the case. As you get down selling final expense insurance by phone, you will come across numerous resources promising unbelievable results, but the questions is are they really effective? Your work should reflect what you want to be, do you want to be another industry worker or a leader in the industry? Someone once said “give a man a fish and you feed him for a day, teach him how to fish and you feed him for a lifetime.” Anyone can offer you two cents, but will it really make a difference in your life. The real wealth is in the knowledge you gain from true and consistent guidance. These are certain concepts that top producers have learned during their long working experience as insurance salespeople. These concepts apply to all products, including final expense insurance. By learning which agents are performing consistently, you can take guidance from them and ultimately bring a new shine to your selling strategy. Get the right attitude: It may sound a bit cheesy, but the right attitude is important. I am not talking about being a deep thinking philosopher, but you should spend some time in applying professional ethics in your work. I have seen a drastic change in my business since I applied the right attitude towards my work. This did not come to me on its own, I spend some time with some of the industry’s top individuals and observed the way they balance the execution of relaxation and skill. Even though these individuals are at the top of their game, they would always plan ahead for the coming day. They used to discuss with me the benefits of time management for rest and work, and would set aside three periods during the day when they used to concentrate on their calls. They taught me about maintaining a healthy attitude towards work and life. Rome wasn’t built in a day: Everyone has set goals for themselves, and they work day and night to achieve them. Burning the midnight oil and working continuously for hours at a stretch is common among us. If you are among these people, you may need to slow down a bit and take stock. Analyze whether you are able to concentrate consistently throughout the day. For how many hours are you really productive? Do you provide enough time for your family and friends? Working seven days a week and late at night will take a hit on your personal life, and before that it will bring you down too. You should give your body and mind rest for at least one day. You will feel the difference as you do so. A fresh mind is brimming with more productive thoughts and can perform better under pressure. Stay Focused: Stay focused on your goals, you may not get results in an instant, but persevere. Constantly changing your goals will get you nowhere. The majority of top insurance agents do not rush to achieve results, but they think of the long term. If you decide to make certain calls at a given time every day, than you should stick to this plan. No plan is good until it is implemented. Consistency will bring fruitful results at the end of the month. Every single brick contributes to a complete home; every single properly handled call will enable you to sell insurance and increase your commission over time. Many people enroll as insurance agents, but very few are able to make a lasting impression. It is easy to become frustrated by endless calls that lead you nowhere. It is not easy to make a person take out their wallet and give you money. This requires proper planning from your side. You may be street savvy, but your smartness will be put to the test here. The first thing is to have patience and think as a customer. What a customer may say to you when you approach them; how would you respond when an insurance agent contacts you. This is a good way to learn how to deal with a situation. It is important to understand the psychology of a client. Put their needs first and your burial insurance sales will start to flourish.